Captured from the inside of one of the revolving cable cars that takes you to the top of Table Mountain, Cape Town. You can see the second cable car in the distance on its way down as we make our ascent. From the inside you certainly get a spectacular view of Cape Town disappearing beneath you as the mountain looms closer. The cable car revolves continuously in slow 360 degree circles on the way up and down to be sure you have taken in all angles! Although you are inside you really get to appreciate the great outside! 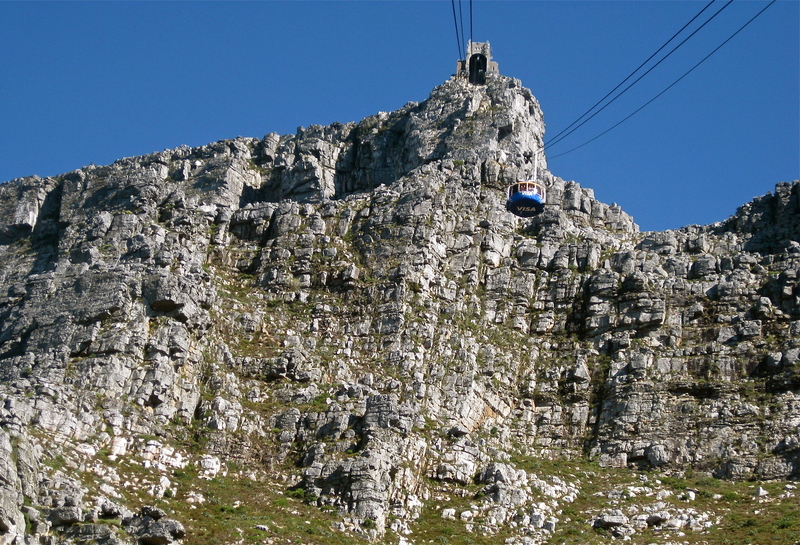 This entry was posted in Photo Challenge and tagged Cable Car, Cape Town, Inside, Weekly Photo Challenge by Chasquita. Bookmark the permalink. It is indeed, I am having so much fun exploring. Do I see you have been to Hermanus? I am heading there soon hoping to see a whale. Can you recommend any walks?